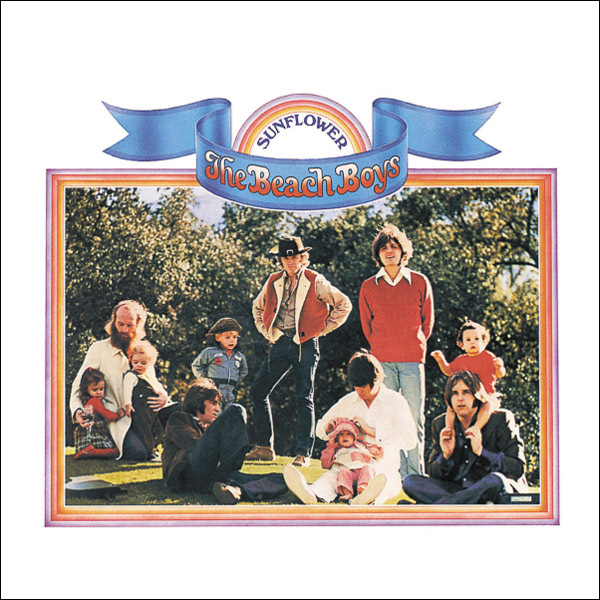 With Brian actively participating along with everybody else, Dennis and Bruce in particular hitting personal peaks, Sunflower sees the band full of optimism after switching record labels, though the album ended up being a disheartening commercial failure despite being a major artistic success. The original version of this album was originally titled Add Some Music and was rejected by Reprise as being not good enough, but take two certainly was, and I’d rank Sunflower as their third best overall album and their best non-Brian dominated album. Engineer Steve Desper deserves a lot of credit for the album’s sparkling sound quality, as again the band delivered a warmly upbeat, summery pop album that has in recent years finally started to get some long overdue acclaim. The harmonies are amazing throughout, and Sunflower is a lovely, uplifting, and varied album. Much of the variety comes from Dennis, who delivers the harder edged numbers, starting with the tuneful pop rocker “Slip On Through” and also including the horny yet humorous “Got To Know The Woman,” which has a funky rockabilly flavour, and “It’s About Time,” another convincing rocker sung by Carl. Of course, Dennis’ main contribution to Sunflower, indeed the best song he ever wrote, is “Forever,” which is simply one of the most beautiful and romantic love songs ever. I don’t know what’s more perfect, his crooned lead vocal or his band mates’ airy harmonies, and even Brian was moved to comment “‘Forever’ has to be the most harmonically beautiful thing I’ve ever heard…it’s a rock and roll prayer.” For his part, Bruce is the primary writer and singer on “Diedre,” a light and airy lovely, and the melodramatic “Tears In The Morning,” whose tale of broken romance is at odds with the rest of the album. It’s still a fine song, however, and unsurprisingly Brian also delivers some first rate stuff, including “This Whole World,” an easily loveable mini-masterpiece (1:56) on which Carl sings lead (you can always tell because he’s the band’s most soulful and powerful singer), the gloriously harmonious “Add Some Music To Your Day,” which should’ve been a big hit but unfortunately wasn’t, and “Cool, Cool Water,” on which Brian the production maestro is again at the peak of his powers. The album’s longest (5:03) and most experimental track, this water evoking multi-sectioned number is almost impossible to describe so I’d suggest you simply check it out for yourself. Other lovely Brian tracks like the Love-sung “All I Wanna Do,” which has a wispy Friends-like fragility, and the lush Carl-sung “Our Sweet Love,” also fit in just right, and even Al’s strange, child-like “At My Window” has its moments as well. All in all, despite some corny moments and slight songs as per usual, Sunflower is just a beginning-to-end pleasure to listen to, as the band was really onto something special here (helped in part by song writing contributions from non-band members on three key songs). Basically, the goal of this album’s music is to make people feel good and lift their spirits, and Sunflower does just that, at least for me it does.